Valerie Bothell: Then on to Nebraska! That evening the Quilt Alliance had an event called Quilters Take Omaha and it was held at the newly located Accuquilt headquarters. Did you know that all employees at Accuquilt have to spend 2 hours a week on company time making quilts in their Dream Studio? What a great company to work for! 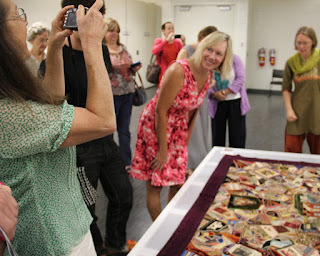 One of the purposes of the Quilt Alliance is to document quilts and quiltmakers so their stories will not be lost. Have you ever found an old quilt and wondered why the person made it? Pictured above is Marin Hanson, Curator of Exhibitions for the International Quilt Study Center in Lincoln, Nebraska. During the course of the evening several quilts were displayed and a video recording was made of the person speaking about the quilt's story. Marin choose a quilt from the IQSC and she had three minutes to explain the meaning of this quilt. All videos made by the Quilt Alliance are then filed in the Library of Congress and are available for viewing. 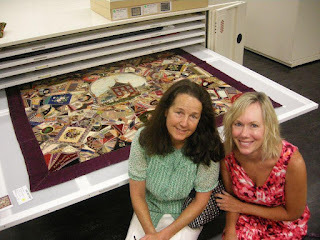 What a wonderful way to preserve quilt history! We traveled to the International Quilt Study Center in Lincoln to see the crazy quilt of all crazy quilts! Yes, we were taken to the storage area of the facility and allowed to view....MY CRAZY DREAM! Yes, that is the crazy quilt that is on Penny McMorris's book! To tell you I was in heaven doesn't even describe it...do you see the smile on Allie's face? It truly was a magical moment and that quilt is beyond description and NO picture around can do it justice! It was the best ending for a very wonderful trip and two very happy crazy quilters!